Powers/Abilities: All named Dark Gods displayed different abilities. The average unnamed Dark God presumably has enhanced strength and durability to an unknown degree. They wielded weapons and armor and had strength in numbers. Traits: All named Dark Gods displayed different traits. The average Dark God soldiers seen had a humanoid, but semi-reptilian appearance, with four or five fingers on each hand with opposable thumb. Instead of a nose they had two nostrils in the middle of their face. The slave-driver Dark Gods wore armor and helmets that made their features impossible to see, however they were very large, and had four fingers on each hand with opposable thumb. They also may have had orange hair, or that may have been an extension of their helmets. History: (Thor II#9 (fb))- A long time ago, Odin sent out scouts to explore the universe. One scout named Lonkarr, happened upon a city called Narcisson, which was like the evil twin of Asgard. While there he was attacked by a woman named Tserron. They battled for hours until Lonkarr killed her, upon which Perrikus arrived and told Lonkarr that he had killed his wife. Lonkarr escaped and warned Odin of these horrible Dark Gods, and a war ensued. The War went on for two weeks until the Dark Gods stood triumphant. The ruler of the Dark Gods, Majeston Zelia, offered Odin a position as her consort, and if he took it, she would spare his people. He refused, and Perrikus was about to kill Odin, when a young Thor inspired his father to keep fighting and threw him a broken spear. Odin triumphed, and defeated the Dark Gods. Odin banished all of them, but kept Perrikus in a special cell in Asgard. He then erased the memories of the war from everyone's mind but his since it was so traumatic. (Journey into Mystery I#513 (BTS))- Seeing an opportunity to gain revenge on the Asgardians following their battle with Seth, the Dark Gods assaulted Asgard and took many of the Asgardians captive. (Thor II#1)- Thor arrived in Asgard to find it in ruins. He freaked out and threw his hammer. After he left, Perrikus emerged from the building he destroyed and shouted that he was free. (Thor II#4)- Perrikus was seen talking to Adva, another Dark God. When asked, he said that he couldn't find Thor, and Thor was probably dead, or had left. Later Adva moved materials into Asgard through a portal, while Perrikus addressed Majeston Zelia through a link. He promised her that Asgard would be ready by tomorrow. (Thor II#5)- Perrikus told Adva to open a portal to Asgard so that Zelia could enter. Adva obeyed, and Zelia arriveds on Asgard and screamed that Asgard was hers. Odin was seen chained to a giant machine. 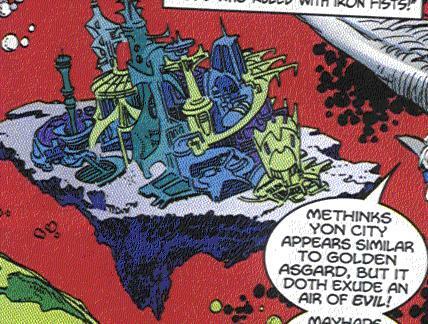 (Thor II#6 (BTS))- Olympus was found destroyed, another instance of the Dark Gods' handiwork. (Thor II#7)- Majeston Zelia wanted Adva to bring Odin to Asgard so he could see what she had done to it. Adva obeyed and brought Odin. Zelia began to taunt Odin, and when he asked her if she thought she had won, she replied that she had. She taunted him some more, and when he spat in her face, she smacked him around. Odin promised they would feel his wrath. 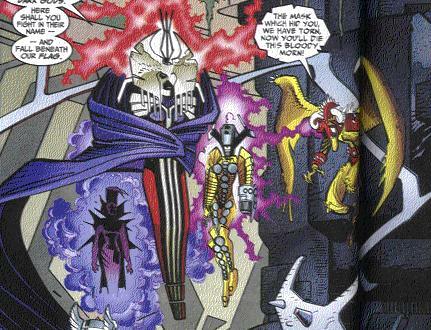 Perrikus told him they had already won, and Zelia revealed that D'Chel the Deceptor had made it look like the Asgardians had destroyed the Olympians, when indeed it was the Dark Gods. They demonstrated D'Chel's power as he made Perrikus look like Odin. They said they wanted Odin's complete defeat, and Perrikus hit Odin. (Thor II#8, Peter Parker: Spider-Man II#2)- Zelia was bored and wanted amusement and told Perrikus to amuse her. Perrikus wanted to kill Odin, but Zelia had competition lined up for him. Tokkots, another Dark God then asked to kill Odin. Zelia brought in Balder to fight with Perrikus. Tokkots wanted to kill him also, but Zelia became annoyed and blasted him. Perrikus made quick work of Balder and slashed him across the chest with his scythe. Tokkots wandered off and found a vortex that Thor left when he tried to return to Asgard. Tokkots went through it and arrived on Earth where he fought with Thor and Spider-Man. (Thor II#9)- Perrikus was taunting Odin about how weak they had made him, when Tokkots returned and tikd Perrikus that he had found Thor, which made Perrikus happy since now he could kill him. (Thor II#10)- Perrikus had Adva search for Thor. When she could not detect him (see comments), Zelia suggested that Perrikus lay some bait, and Thor would come. Perrikus then instructed Adva to cast an image of him over New York City. Adva did so, and Perrikus called out Thor. He then took a bloodied Sif, and held her by her cape and threatened to kill her if Thor didn't come to fight. When Thor arrived, Adva informed Perrikus that he had come to Asgard. Perrikus was really happy that finally he would have his revenge. Thor came in and was greeted by Majeston Zelia, alongside Adva, D'Chel, and Tokkots. Zelia introduced them and then said that Thor would die. She called for Perrikus, who then began to fight Thor. They fought, and nobody had a clear advantage until Perrikus cut Thor's hammer with his scythe, and then went on to beat the living hell out of Thor. After 60 seconds away from his hammer, Thor turned into Jake Olsen, his mortal guise. He was forced to escape into the sewer. While Zelia took joy in his fleeing like a coward, Perrikus was enraged. (Thor II#11)- Perrikus yelled for Thor. Zelia said that he wasn't going to come out and Perrikus had to fetch him. After failing to lift Thor's hammer, Perrikus blasted open the sewer, to see that Thor was gone. Thor, as Jake Olsen, was crawling through the tunnels when he was discovered by some slave-masters. They took him before Slototh, to approve of him to work. Slototh was the incarnation of filth and muck and slime. The slave-masters beat up Jake Olsen, until Slototh realized he was from Earth. They put him to work. Meanwhile Zelia's infinite vision failed to find Thor, and Tokkots went out to look for him. Back in the underground, Jake Olsen saw some slave-drivers beating on Volstagg. Jake attacked one, who was revealed to be Tokkots in disguise. Tokkots brought Jake before Perrikus. Perrikus was mad that Thor was in a weak mortal guise. He beat up Jake, until Jake managed to get his hammer and transformed back into Thor. Thor teleported out, and again, Zelia was happy to see him cower, while Perrikus was enraged. (Thor II#12)- The Dark Gods were telling Perrikus that he should have killed Thor. Then Adva told them that Thor had just arrived with the Destroyer and Hercules to back him up. The heroes were immediately attacked from all sides by thousands of Dark Gods. Thor and Perrikus fought, while the Destroyer and Hercules fought the countless others. The fight went on until Zelia attacked with a huge energy blast that cut through Asgard's crust. Thor went underground and transformed into Olsen, while Hercules and the Destroyer continued to fight. Hercules and tje Destroyer slowly had the tide of battle turn against them, since the Dark Gods outnumbered them so much. Meanwhile Jake Olsen spotted The Warriors Three being held captive by slave-master Dark Gods. Jake knocked out one of the Slave-masters with a needle full of sodium pentothal. The Warriors Three battled the slave-masters while Jake summoned Replicus via a laptop. Back at the surface, Tokkots was about to kill Odin with a sword, but before he could, Replicus killed him, and freed Odin, Sif, and Balder. Zelia shouted that Odin would never win. Hercules battled Perrikus while the Destroyer took on all the countless soldiers. Thor and The Warriors Three returned to the battle and the heroes slowly started winning. When Zelia realized they were in jeopardy, she called Adva to her side, and merged all of the soldiers, slave-masters, and other Dark Gods into one monster. The monster did a lot of damage and seemed unstoppable, until Thor attacked Zelia and Odin tackled her and took back the power that she stole from him. The Dark Gods disappeared, spread throughout the solar winds, and Asgard was reclaimed. (Thor II#42)- Lots of Dark Gods were seen waiting and dreading the arrival of Desak, killer of gods. (Thor II#43)- Desak massacred many of Dark Gods. He fought Perrikus and beat him up badly and easily. Perrikus narrowly escaped with Adva. (Thor II#53)- Perrikus and Adva appeared on the Rainbow Bridge, and Perrikus knocked out Heimdall and started to shatter the bridge. Perrikus then confronted and attacked Thor, who now wielded the Odin-power, since Odin died. Adva teleported Thor's hammer away, so he grabbed the bloodaxe to fight. They fought back and forth until Thor cut off Perrikus's arm with the Bloodaxe. He then threatened to kill him with his own scythe if he and Adva didn't give him back his hammer and leave. But first he demanded to know who sent them. Perrikus said that he was under instructions from Zarrko the Tomorrow Man. Comments: Created by Dan Jurgens and John Romita Jr. I love the villain that is the dark reflection of his/her hero counterpart, like the Abomination is for the Hulk, or Venom is for Spider-man. That said, I love the Dark Gods, for not only are they a counterpart for Thor, but for all of Asgard as well. However, I don't understand why the Dark Gods speak normal English as opposed to the type the Asgardians and Olympians speak. Adva was unable to detect Thor because do to an arrangement with Marnot, who was actually a raven of Odin, Thor had to live out the rest of Jake Olsen's life. Jake Olsen was a man who died during Thor's battle with The Destroyer. To accomplish this, Jake and Thor were sort of molecularly bonded, like Rick Jones is with Captain Marvel. Thor could switch back and forth from himself to Jake Olsen. While we all thought it was because of responsibility was the reason that Marnot made Thor live out Jake's life, it was actually to prevent detection by the Dark Gods, since when searching, they would find Jake Olsen, but could not find Thor. I don't think it is ever clearly stated which gender Adva is, but I refer to her as a female, since she does have a feminine appearance in my view. My personal opinion is that she might be a robot. "Master of the Continuum Gate," Adva is a loyal servant of Perrikus and Majeston Zelia. Whenever the Dark Gods needed transportation, or information, they went to her/him/it. Adva aided the Dark Gods on several occasions, including transporting materials to Asgard, casting Perrikus's image over New York City, searching for Thor, helping Zelia form the Union, and more. 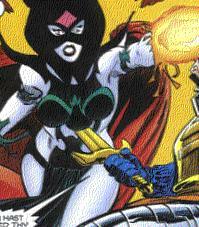 D'Chel was present alongside Majeston Zelia and was responsible for tricking the Olympians into believing that it was the Asgardians that had destroyed Olympus. Other than that, he had very little role in the story. His current whereabouts are unknown. D'Chel possessed phenomenal illusion-casting powers, able to trick even God-heads like Odin or Zeus. He had a shadowy appearance, and never saw any combat. The home of the Dark Gods was the city of Narcisson. It was discovered by a scout of Odin named Lonkarr, and following Lonkarr's return to Odin, the first war ensued between the Dark Gods and Asgardians. It is like a dark, evil version of Asgard, in appearance, in morals, and inhabitants. Narcisson's current condition, or if any Dark Gods live there now, is unknown. Slototh was the incarnation of muck, slime, excrement, filth, sludge, and all that is discarded. He was underneath Asgard during its time under the heel of the Dark Gods. He was in charge of the slaves who toiled there. Any new worker had to be brought before him before he could work. Jake Olsen (Thor) was brought before him to be cleared to work. He realized that Jake was from Earth. His abilities are mostly undocumented. He appeared to be almost growing out of the filth around him. He could extend his tentacle like extensions and ensnarl someone. He also may have had a degree of super strength proportionate to his immense size. 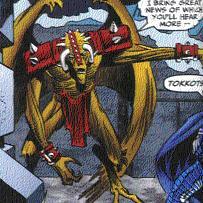 Tokkots was a large winged Dark God, who always spoke in rhyme. I've never understood why some characters only capable of speaking in rhyme. He went to Earth and battled Thor and Spider-man, and brought back the information Thor was alive. He subdued Jake Olsen and brought him before Perrikus. He was killed by Replicus moments before he could slay Odin. Tokkots was always very bloodthirsty, always wanting to kill anyone he could. He was also quite tall, with exceptional strength and durability. He could rot things with his touch, and make copies of himself, which apparently all shared one mind. His wings allowed him the power of flight as well. Tserron was the wife of Perrikus. She was encountered on Lonkarr's scout mission, when he was sent by Odin to explore. He battled her, and eventually slew her with his sword. Lonkarr's discovery, and subsequent return to tell Odin of it, led to the first war between the Dark Gods and Asgardians. 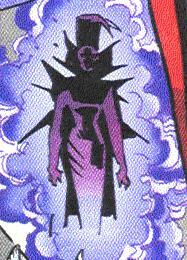 Tserron displayed the ability of shooting energy blasts, teleportation, and an undefined degree of super strength.